Get Vendio Gallery - Now FREE! Antique Faience Larger Beer Stein/Pitcher Schrezheim Floral c. Description: Presented is an early German beer stein made around early 1800s. The stein was made in the factory of Schrezheim - one of the largest faience factory in Germany. The stein is made from traditional Schrezheim reddish clay and glazed with white tin glaze. It is decorated with typical Schrezheim floral decorations in green, blue, yellow and magenta colors. The pewter mountings consist of pewter lid with acorn thumblift, typical for Biedermeier period of 1810 - 1840, and foot ring. Schrezheim was very famous in late 1700s to early 1800s for it's faience work and also for the best quality pewter lids. The stein is not in great condition. There are two lines repaired and the handle was broken and glued back in. Still, this is a great window object, the damages are not very visible. The pewter is in excellent condtion. The stein is 1o tall to the top of the thumblift, 1.5 L capacity. 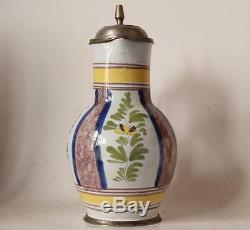 Title: Antique Faience Beer Stein Schrezheim c. Use the FREE Counters 1 million sellers do - Vendio! The item "Antique German Faience Larger Beer Stein/Pitcher Schrezheim Floral c. 1820s" is in sale since Sunday, February 8, 2015. This item is in the category "Collectibles\Breweriana, Beer\Drinkware, Steins\Lidded Steins\Germany". The seller is "beer-stein" and is located in California. This item can be shipped worldwide.